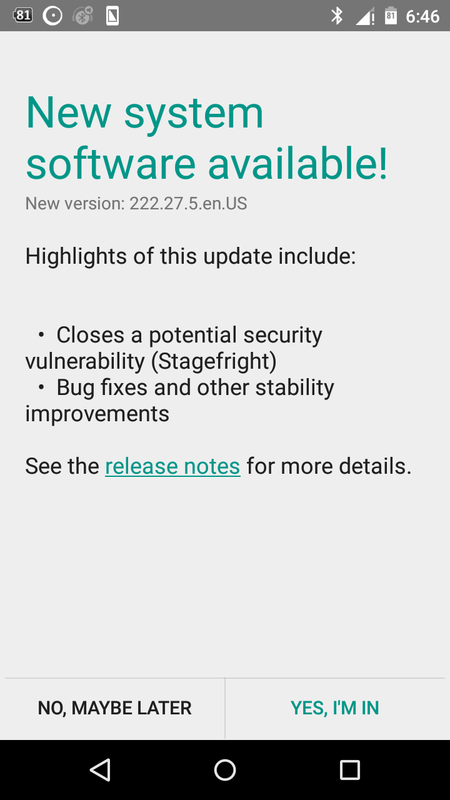 New update for Moto X 1st Gen Developer Edition XT1053 fixes Stagefright bug! It’s been kind of late for Moto X 1st Gen Developer edition to receive Stagefright fix as an OTA update, but it’s finally here. Given how crucial the Stagefright vulnerability is, the fix was awaited by large section of users for sure. The update increments the software version on of Moto X 2013 to 222.27.5.en.US. Apart from the major security fix, there is nothing else worth talking about with the update. This is smallest of changelog as you may get. To update your 1st Gen Moto X Developer edition, check in Settings > About device > System updates. Once again, don’t expect any visual changes from the update. And know that this may break root, and needs stock recovery for installation. If you don’t want to break root, and wanna retain TWRP recovery too, then you can try this flashable zip for Motorola devices that just patches the Stagefright files unofficially. Do make sure first that your device is compatible with the unofficial fix.